(A) Positions at the District Fisheries Development Office under APART project Districts. Annual Remuneration range is Rs. 3.60 lakhs to Rs. 4.80 lakhs for Technical Expert —Fisheries. Age limit 45 years as on 1st January’2019. 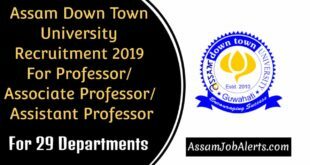 (B) Positions in the Core Project Implementation Unit (CPIU) in the Department of Fisheries, Assam Secretariat, Dispur, Guwahati; Annual Remuneration is Rs. 4.80 lakhs to Rs. 6.00 lakhs: Age limit 50 years as on 01st January’2019. 1.Senior Technical Expert — Fisheries : 01 (One) Post Qualification: Master degree (min two years duration) in Fisheries Science from any Govt. recognized University/ ICAR Institute; Experience: Minimum 5 years in Fisheries Sector. (ii)Directorate of Fisheries reserve the right to increase or decrease the number of position any or scarp any or all of the positions. Potential candidates from India having the requisite qualification may apply in English language strictly as per the prescribed application format available in the website https:lifisheriesdirectocassam.govin alongwith alongwith a cover letter in sealed enveloped indicating ‘Application for the position of so as to reach the provided address given below within 14 days from the date of published of REOI (Date of publication in newspaper is 09/02/2019). Only the short-listed will be called for interview/ viva test canvassing in any form will lead to disqualification and rejection. The last date of receiving duly filled up application form : 14 days from the date of published of REOI (Date of publication in newspaper is 09/02/2019).